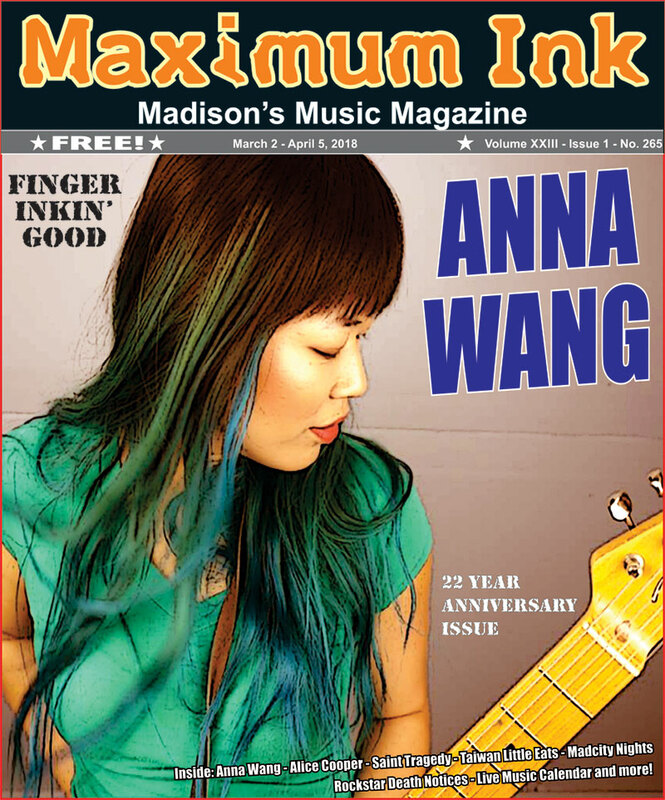 Anna Wang is no stranger to the area music scene. She made a big impression as lead singer and main songwriter for Anna Wang and The Oh Boys!, and in a 2012 Maximum Ink interview talked about sharing the power of songs, mixed with the joy of pop music, while taking on the world with her band. Some scheduling issues and line-up changes meant the eventual end of one project, some time off, and the creation of Tortoise and the Finch. Her talent helped take this duo to the top of the Project M Singer-Songwriter Competition in 2017. But even this success was short-lived. Anna is now a solo artist, but if you think it means she is quietly playing in a corner all alone, you don’t know Anna. She just released a new album of electronic-pop, and commands your attention—whether you are listening to her CD or watching her live—Anna is playing an entire band of instruments and every note of her songs. She’ll be joining with several other musicians, and sharing what she’s learned as part of a multi-part workshop, “The Six Questions of Songwriting,” starting Tuesday, March 6, 2018, 6:30-8:30 pm at 702 East Johnson Street in Madison, as well as solo shows including one she is really looking forward to at ArtIn on East Washington Avenue in Madison on May 17th. Keep reading to learn how Anna feels about being in this current place where she is in control of her music, and her life. Maximum Ink: You moved to the U.S. as a young child, but started you musical journey even before you arrived. Do you credit your family for your early interest in music? Anna Wang: My dad wanted to be a pianist when he was a kid, but his family didn’t have the resources to make it a possibility. So, when he had me, he was determined to have me take piano lessons. My first lessons were in China when I was 3, but I was such a naughty student, three piano teachers quit on me! By second grade, I decided I wanted to give piano another try, and began taking classical piano lessons. I also started writing a lot of poetry at the same time, and somewhere along the way, the two combined and I started writing songs. The summer after middle school, we moved from Florida to Boston. I was new to the city and had no friends, so taught myself how to play guitar out of sheer boredom. MI: You don’t seem bored anymore! Do you consider music a central focus in your life? AW: Songwriting is really therapeutic to me, and I’m relatively certain it’s the one thing keeping me sane, actually! It’s funny because I often find myself without words to express how I feel, but as soon as I pick up an instrument, the words and melody just kind of spill out of me. What’s beautiful to me about writing a song is how many different ways you can express yourself, simultaneously. The lyrics may say one thing, the melody says another, and the rhythm something else. There’s so much you can do with the interplay of it all—I feel like I can say more in a three minute song than if I were to just talk to someone for an hour straight. MI: What keeps you in the Madison area? AW: I was born in Beijing, China, and moved to the states when I was 4. I’ve lived in Madison since I was 15 years old. I moved around a lot as a kid, so I had no desire to move after high school or college. Besides, it would be difficult to find another city as cool as Madison, don’t you think? MI: You’ve had some interesting experiences as part of a few Madison-based bands including Anna Wang and The Oh Boys, and Turtle and the Finch. But you are going solo now? AW: Yes, in the past I’ve always played in bands. For me, it’s been difficult to find other people who not only want to play the same style of music, but also have the same long- term musical goals. More than that though, I think I just realized I can be quite introverted and just enjoy holing up in my room by myself for days making music, and not talking to anyone else. I can also be pretty stubborn when it comes to my musical visions, and sometimes prefer not having to compromise with anyone else. MI: Well, you are one of those talents able to write and perform almost any kind of music. Do you have a style you enjoy the most? AW: Oh, I don’t know. I think variety is the spice of life. Obviously, the electro/synth-pop genre is my favorite to write and perform. But I also love singing and playing the guitar on my couch in the middle of the night, and experimenting with composing in different genres. Really, if I get to make noise, I’m happy! MI: You just released a new electro/synth-pop album, and it is all you on the instruments, writing the music, the songs, producing, recording. Are you happy with it? AW: I recorded In Your Head in a spare bedroom in my house. The walls are blue, so I call it The Blue Room. The album is a collection of songs I wrote over the last few years, but if I had to describe the content, I’d say each track is a moment of excruciatingly intense emotion that has been stretched to last 3-4 minutes and topped with ear candy.. I named the album “In Your Head” because the songs are meant to get stuck in your head. It’s my first time producing and recording myself, and I’m proud of how it turned out. I definitely hear 100,000 things I would do differently now, but I guess that’s to be expected. MI: So, do you have a goal for your new music? AW: I want to share it with as many people as I can. The shared human connection through music is so special and powerful, and I just want to contribute to it. MI: What’s next for you—are you happy with where you are at this point? AW: Yes and no. In the past year, I’ve really pushed myself out of my comfort zone and accomplished some things I’m proud of, such as winning Project M, playing Summerfest, and releasing my album. I just performed my first solo electronic set on 30 Minute Music Hour, and that was both awesome and terrifying. That being said, I’m always kind of plagued with the feeling that I’m running out of time. I don’t know why, but my whole life I’ve just felt like I need to be better, and work faster, and do more, and I never quite get there. MI: Let’s lighten up a little. Anything people may not know about you? I put hot sauce on everything I eat, and Flaming Hot Cheetos are my favorite corn snack.